123 pp. 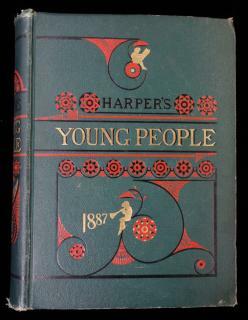 Applied printed color cover with matching dust jacket, color illustrated end papers, color illustrations and activities throughout along with some black and white photographs. A collection of stories,picture strips, animaland fun pictures, verse, puzzle pictures, animaland features, and games and how to makes. Answer key at back of book. Cut Paste Stick Mother Goose Poster Book. Sameul Lowe Co. Kenosha, Wisconsin, n.d.
unpaginated. Color printed paper cover, unused coloring pages with 4 sticky color sheets,cover art by R. Maillet, number 955-10. A coloring/activity book. Readers can cut out the color images on the sticky paper and paste them down on the coloring page where the outline of the picture matches. The pages are unused, the color images are uncut, and the pages are still sticky. 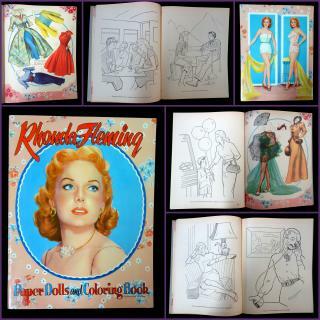 Paper doll book with an illustration of Rhonda Fleming in portrait view, surrounded by brightly colored decorative elements. Two dolls printed on back cover as punch outs, 11" tall. 4 pages of costumes, all uncut, with a decorative border mimicking the pattern on the cover. 48 coloring pages, unused, with captions on the bottom of each coloring page to create a narrative of Rhonda Fleming's life: describing a normal day for a famous actress, presenting her as an ideal for women and young girls to strive for. 14" x 10 3/4"..